I think the problem has to do with my environment variables. The full output of set can be viewed here. I've got a similar problem I'm currently working on solving. I can't say this will solve your error since there may be issues with other software (which is my case with Eclipse Luna). 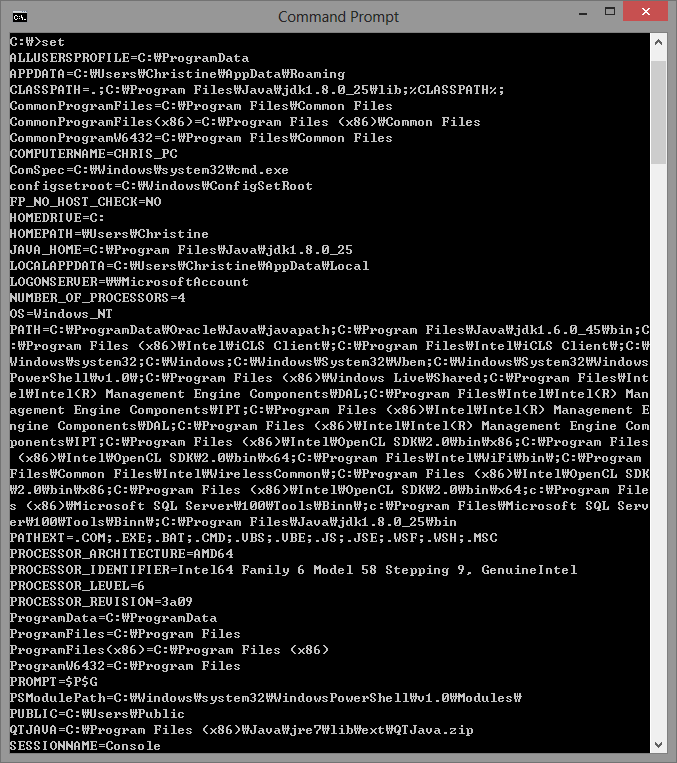 Go to this folder (ProgramData is hidden, so unhide it if necessary) and right click on the java.exe symlink. You'll see in the Target field where it's looking for java.exe. It may be pointing to the java.exe file from your previous jdk1.6.0_45 install. Either paste in new shortcuts here or change the PATH setting as others have mentioned. I've found that the Java installer doesn't change the javapath or update the system path, at least when going from 1.8 to 1.7. In my case changing the shortcuts only led to a problem with Eclipse on startup. EDIT:----- After playing with javapath folder shortcuts it turns out you need symlinks, at least for Eclipse. See, Windows how to create directory symlink. This now works for me. mklink /d C:\ProgramData\Oracle\Java\javapath "C:\Program Files\Java\jdk1.8.0_40\bin\"
The same would work for a JRE if that is all that is required. and that fixed the issue for me. java -version now gives details about the Java version, etc. 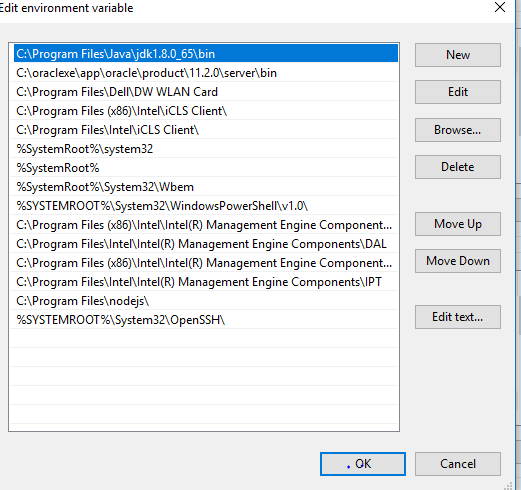 Make your way to Windows' Environment Variables dialog. Add the path of your JDK/JRE's bin folder. Don't forget to set JAVA_HOME. It is useful to set the PATH variable permanently so it will persist after rebooting. Click Start, then Control Panel, then System. Click Advanced, then Environment Variables. Add the location of the bin folder of the JDK installation to the PATH variable in System Variables. The PATH environment variable is a series of directories separated by semicolons (;) and is not case-sensitive. Microsoft Windows looks for programs in the PATH directories in order, from left to right. You should only have one bin directory for a JDK in the path at a time. Those following the first instance are ignored. If you are not sure where to add the JDK path, append it. The new path takes effect in each new command window you open after setting the PATH variable. This usually happens when you update the java, the easiest way to solve this is to just uninstall the JDK & then reinstall it. NOTE: This doesnt remove the path or classpath so no need to worry. Now install JDK and set the path. Run the program.You won't find the same problem anymore. This problem exists when you upgrade from one version to another.because jdk is not automatically upgraded. For the same you can change the environmental varibles. In system variables look for the PATH and add the jdk bin location in the front of the string(not at the back). Once you have done that check in CMD if "java" and "javac" works. if it works, again go to system variables. add "CLASSPATH" A the variable and set value " . c:\Program Files\Java\jdk1.8.0_91\lib;"
I got the same after installing java8 from a non-permissioned account. To fix I simply reinstalled from admin user account. This created the quoted directory with file links to java exes. I had also similar problem where by I had to un-install JDK 1.8 and needed jdk 1.7. What i did was removed the symbolic links from the javapath and then imported the shortcuts of java, javaw, javaws from the bin directory to the javapath folder. However, I found some permission issues in the enterprise laptop where by I did not have the privilege to modify/ update this directory. I had given appropriate permission from the administrator and there by resolved it. mklink /d C:\ProgramData\Oracle\Java\javapath "C:\Program Files\Java\jdk1.8.0_60\bin"
Now right-click it and choose "Run as Administrator". Provide admin credentials. The script should report success. Now you can compile or run Java. c:\ProgramData\Java\javapath is used for symlinks. You can of course add the full path to your Java Path to %PATH%, but equally you can create a symlink to the path to the above location. Not the answer you're looking for? Browse other questions tagged java environment-variables or ask your own question. Which JRE does C:\ProgramData\Oracle\Java\javapath\java.exe use?